Last week’s Danceathon held at The Spires Shopping Centre in High Barnet, has so far raised a massive £3,685 with more in the pipeline! 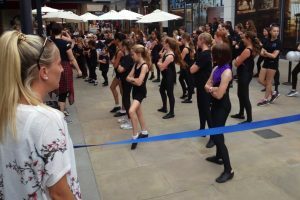 Organised by Highstone Dance Academy in association with The Coffee Bean shop/café, the two & a half hour long event took place on Thursday 12th July. It was put on to help recoup monies stolen from our event in June & a grand total of 64 dancers took up the challenge, aged between 4 & 15 years old. 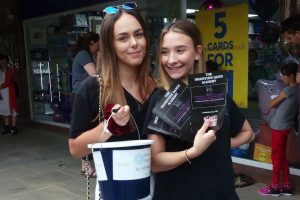 Parents & children alike held out donation buckets to passing shoppers & members of the general public, most of whom warmed to the community spirit on show. Set up in 1989, Highstone Dance Academy is a fully established I.S.T.D. (Imperial Society of Teachers of Dancing) school of dance. It covers a wide range of styles including classical ballet, tap, commercial jazz (freestyle dance to chart & club music), lyrical & contemporary to name a few variations. Their dancers have performed at our main events for the past 8 years & the school has established itself as a special part of the community, welcoming every one of all ages, regardless of their ability & ambitions. A number of other local businesses including Waitrose, Savers, Anytime Gym, Orchid Retreat & The Black Horse public house also supported the event, by donating prizes to the raffle set up by Coffee Bean. 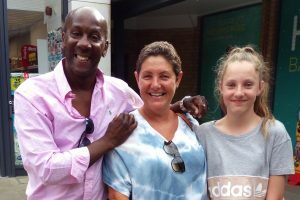 After a remarkable response Highstone’s managing director & co-owner Sally Assoul commented on the Danceathon success by saying, “I am so proud of all of our Highstone Dancers… What an amazing event raising money for Cherry Lodge Cancer Care in Barnet & Summer Soulstice”. For more info on Highstone Dance Academy, go to their Facebook Page.